“Let’s go for a ride!” advertised our local BMW motorcycle dealer. They organized in early August a day-ride called “Conquer the Cascades” which would run on a dirt road on a ridge of the Cascade Mountains starting just south of Oakridge, OR. After a few miles going south it would take another road going east through valleys and mountain sides in the direction of Summit Lake and Crescent Lake, ending in Crescent, OR. A total of about 100 miles of fun dirt roads! 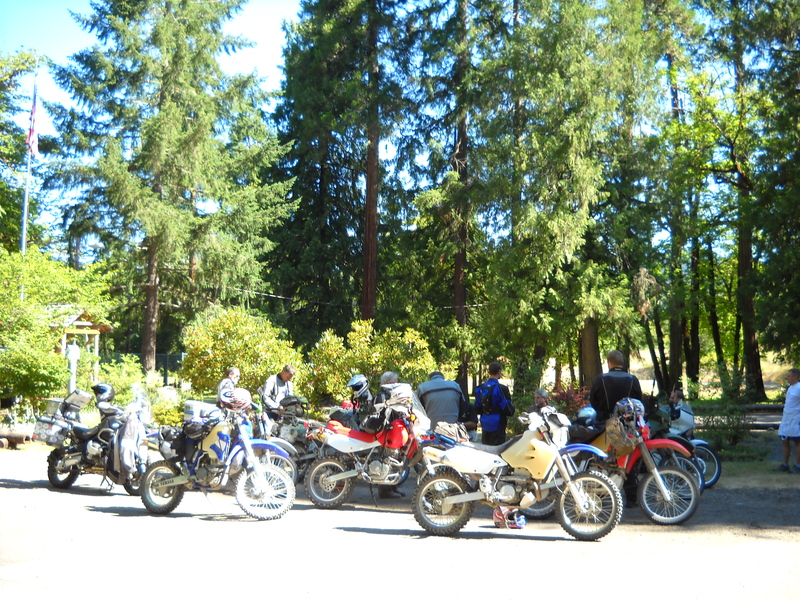 Riders met at a park by the Willamette river, just outside Oakridge. I rode my 2006 BMW Dakar to the event. 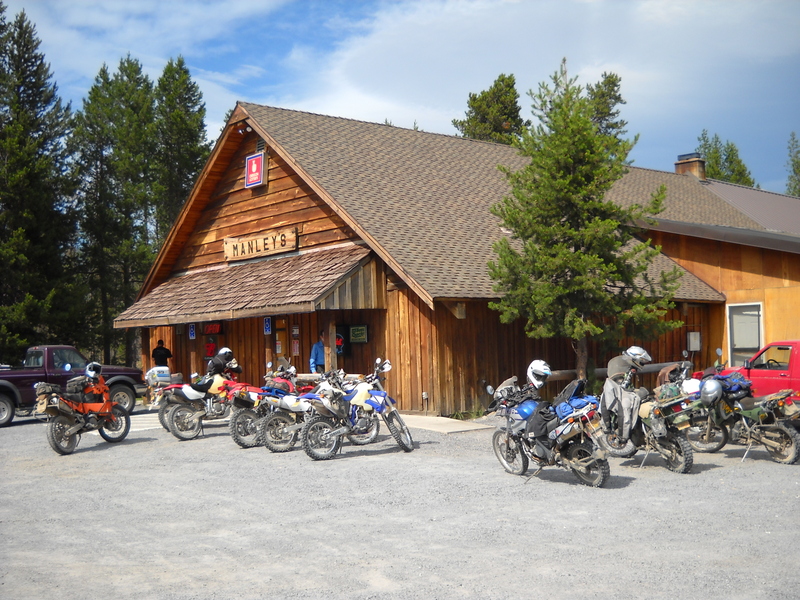 Upon arriving at the gathering place I took a look at all bikes taking place on the ride: very few BMW 1200 GS bikes were there. I was expecting more of those bikes, which would translate into a slow ride. If that was the case, I could jump to the front and be dust free without having to push on the speed. But no, the story would be different. 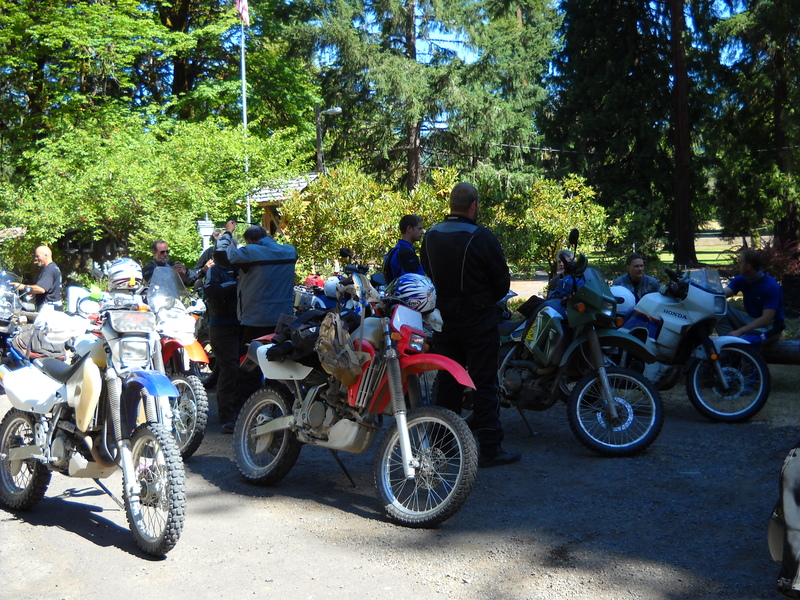 Most people showed up with their thumpers (single-cylinder dirt or dual sport bikes). There were the infamous XR650R’s, the DR650’s and DR400’s, a couple of Y450F’s, a KLR or two, basically all the numbers and letter codes associated with Honda, Suzuki, Kawazaki and Yamaha thumpers. There was another Dakar like mine, an F800GS, and a X-Challenge. 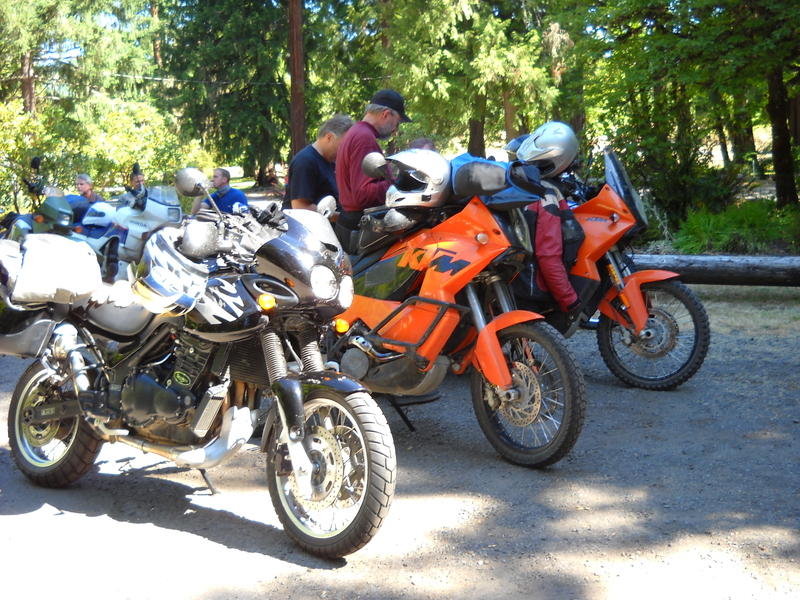 There was also a Girlie Tiger and a couple of KTM 950 Adventures. 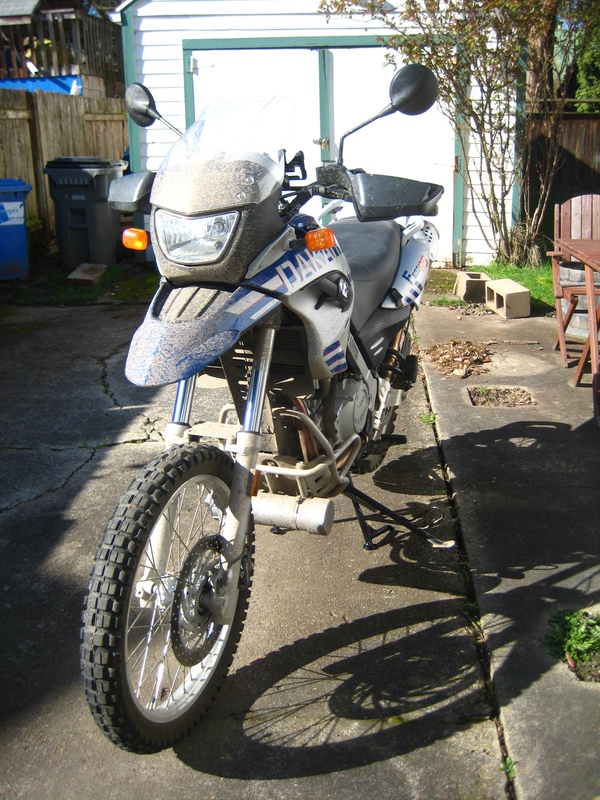 And the rarity prize went to a Honda Transalp. “Everyone should ride their own ride” is an important motto. I enjoy riding on my own pace, in the zone, my zone, concentrated but relaxed, at the upper bands of my comfort zone. And of course, when talking about dirt riding, being dust free is a must! It is an art to get that piece of mind when riding with large groups, especially when you don’t know the other riders and they don’t know you. In group rides I don’t want my natural pace to be faster than the pace of the guy ahead of me. Or slower than they guy behind me. In group rides, the ideal is to find the order in which everyone is in their zone and having the most fun. Which means faster riders towards the front, slower guys towards the back. The challenge is to get this sorted along the way. Waking me up from my conjectures, the organizers gave us the instructions. The ride would start with a climb up to the beginning of the ridge on one-lane paved roads. From there we would hit gravel, two-track, some technical segments, then gravel again before hitting Summit Lake. From Summit Lake we would get on some sandy and rocky tracks until reaching Crescent Lake and from there a short burst on paved roads to Manley’s pub in Crescent, for that rewarding cold beer. And then the important final words: “…and remember: this is not a race”. who I believed would lead us on this ride. So I’m second and as soon as we leave the parking area the other X650R passed me. So now I’m third but not too worried, as we are taking a paved road first – no dust. We start the climb on the one-laner, and I’m assuming we will take this slowly before hitting the point where real ride starts: the gravel! Nope, I’m on the second curve of that road and I can’t see the 650Rs anymore. They are gone! I speed up but with no intentions nor hopes of catching them up. They are real hooligans. I’m on my Sunday ride. As I’m admiring the situation that is forming, or disappearing ahead of me, I hear this thumping sound to my left, I check my mirrors and they are full of green barkbusters. Some guy on a DR650 is trying to pass me on a tight left hand curve. I slowed down slightly and motioned him to pass me. Too late, it seemed, as he decided to tuck in behind me – “it was too tight” he later explained to me. I could have let him by on the next straight section. Instead, I decided to solve the problem by cranking up a notch and making that 650 Rotax motor in my BMW go through its paces. That 650 single-cylinder is one thing on the 3K RPM range. It is another between 5 and 7K RPMs. With only a short 2K range of real power, though, and a widely spaced five-speed gearbox, you get to work it out to make it go fast while going up a hill with curves every hundred yards or less. And working it out I managed to keep those green barkbusters at bay. I actually gained distance on him and whenever I didn’t see him for a while I’d slow down. As soon as I would see him peeking out from behind the trees on another curve, I would crank it up again. Rinse, repeat. I was pushing the envelope, expanding the band of my comfort zone. It was rather unsettling to feel my bike’s well used up Metzeler Karoo knobby rear tire skipping and fighting for grip under acceleration on a few corners. But it was great excitement as well. I was stoked by how the machine was keeping things composed. At the end of the day I wanted to hug that Dakar. And I had a totally new take on pavement riding, something I’m still learning to do, as I mostly ride off-pavement. Several miles on this fast pace, though, and I wanted to take a break. I could not wait to get on the dirt part of the ride. We finally reached a point where the two X650Rs were waiting for the rest of the group. When I learned there was still going to be several more miles of pavement before hitting dirt, I decided to let those hooligans go ahead of me. I settled on a nice pace behind an X-Challenge and ahead of an F800GS. Eventually everyone gathered at the end of the paved section. From that point forward it would be dirt only. Leadership changed, and someone on a DR400 led the way, followed closely by a KLR and one of the X650Rs. As I was fumbling with disabling my ABS (it requires to start the bike pressing the ABS switch for a few seconds) a few people jumped ahead of me, including that DR650 (with those green bark-busters), the X-Challenge and the F800GS. I will pass them and won’t stop until I get to Manley’s pub!” I was getting thirsty anyway. A few miles later they stopped at an intersection and I went by them. I cranked a notch up and was having a blast on a two-track road. After a while on that road I saw this off-shoot to the left, on a very vertical and technical climb and assumed it would not be the way, and kept going without checking my GPS. A mistake. All of a sudden the road ended! I turned around, tail down, and went back to that off-shoot to the left. When I get there a few bikes were gathered, waiting at the intersection. I went past them without stopping and climbed that steep hill with anger. From that time on, I was leading this smaller pack of bikes, following my GPS and stopping at every intersection to wait for whom ever was behind me and make sure they were going the right way. The Tiger and one of the KTMs were following me closely. At one point when I was waiting for them at an intersection, they blew past me without stopping. And that, my friends, turned this ride into a race. Well, not really. But I cranked up a second notch, passed them back and made sure they stayed behind me. That Dakar was power sliding through gravel corners! I had a blast all the way to Manley’s restaurant. 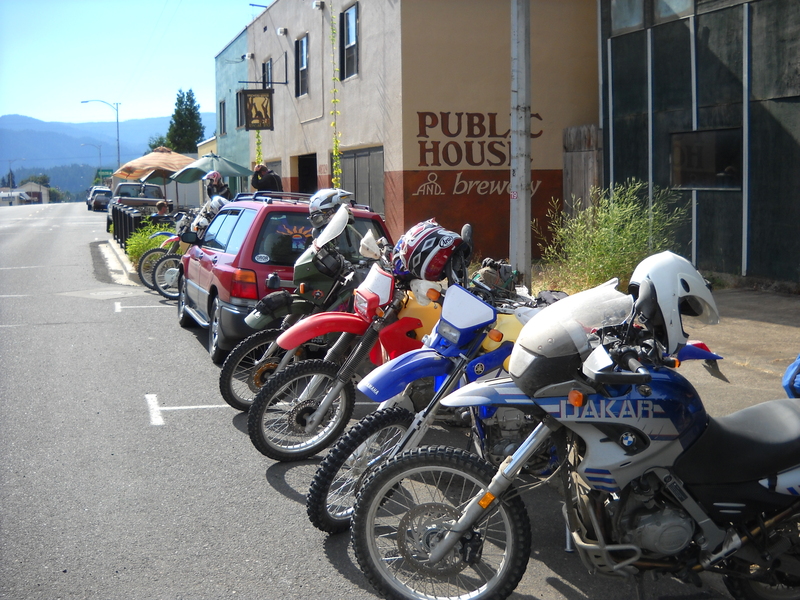 On the way back home, at a much slower pace, some of us stopped for a beer at a local brewery in Oakridge. The Dakar earned my respect on this ride! I had never pushed that bike to its limits. When it was asked to step up to the plate, it delivered with plenty to spare, both on pavement and off pavement. Although this bike is mostly known for round-the-world adventures, it showed that day that it can deliver a more aggressive performance. It deserved being called “Dakar” that day. And I, well, I was a Hooligan for a day! That was a great day! I was the on the XR you followed out of Oakridge and remember you called me a hooligan once you caught up with us…thanks. Once it gets good and frozen we will do an ice ride to the coast for lunch, are you game?